Two police men , including an undercover cop and a detective, were Thursday arraigned on a charge of allegedly murdering a city businessman last month. Investigators said Detective Corporal, Derwin Eastman and intelligence policeman, Jameson Williams murdered Godfrey “Sagga” Scipio and on October 12, 2017 at Stanley Place and David Street, Kitty. Eastman, a former Best Cop, and Williams were charged based on allegation made by the alleged hit-man and ex-convict, Aubrey Bobb, that he was hired and given the gun by Eastman to commit the act. 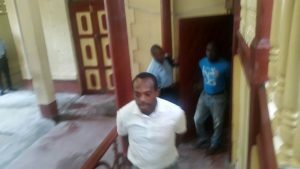 City Magistrate, Judy Latchman remanded the duo to prison until December 5, 2017, but not before asking Police Prosecutor, Stephen Telford to address concerns by the defence lawyers about the safety of their clients. Telford told the court that those concerns would have to be dealt with by the prison authorities. The prosecutor also gave an undertaking to ensure that an alleged threat against Eastman by an identifiable person again is investigated. Attorney-at-Law, Nigel Hughes told the court that Eastman has over the years successfully investigated many crimes and so his safety in the prisons is at risk. He also noted that moments before the case was called, an identifiable member of the public, who was previously charged and remanded, threatened Eastman. In dealing with the allegation of murder, Hughes said “there has been no independent corroboration oif the allegation against Mr. Eastman. During the hearing, a sobbing woman was escorted out of the courtroom as Hughes was expressing concern for Eastman’s safety. 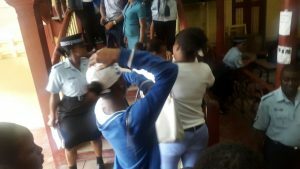 After the hearing was completed and the prisoners were exiting the chute to go the lockups downstairs of the Georgetown Magistrates’ Court, the sobbing women huddled together. While Eastman was being placed in a separate cell, he shouted the names of three policemen as he held a bottle of water.